Well bred stakes winner who was 2nd (beaten a short head) in a very good renewal of the Gr.2 Italian Derby. Would make a great stallion prospect. Highest Honor - high-class 7-10f performer, successful French sire, capable of siring very smart 2yos. (2007 c. by Highest Honor (FR)), see above. won 2 races at 2 and 3 years in Italy and £163,566 including Premio Botticelli, Rome, L., placed 4 times including second in Derby Italiano Better, Rome, Gr.2; also placed once over hurdles. Santa Biatra (FR) (2006 f. by Highest Honor (FR)), won 6 races at 3 to 5 years in France and £110,485 and placed 9 times including third in Prix Belle de Nuit, Deauville, L. and Prix Panacee, Toulouse, L.
NIKE WALKER (FR) (2003 g. by Bering), won 6 races at 2 and 3 years in France and £48,400 and placed 5 times; also won 3 races over hurdles and placed twice. 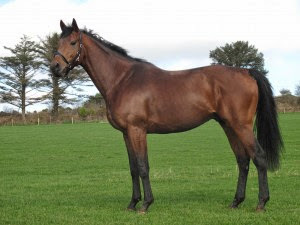 ALBIZZI (FR) (2004 f. by Highest Honor (FR)), won 1 race at 2 years in France and £10,003 and placed 3 times. Mister Alexis (FR) (2002 g. by Bering), placed 6 times at 2 and 3 years in France. Ebony (FR) (2001 f. by Emperor Jones (USA)), placed 5 times at 2 to 4 years in France. Mietres (IRE) (2009 f. by Layman (USA)), placed once at 3 years in Italy. Singer Jon (USA) (c. by Dixieland Band (USA)), won 4 races in Japan, placed third in Keisei Hai Sansai Stakes, Tokyo, L.
CASTELLI SINGER (USA), won 3 races at 3 years in U.S.A. and £29,879; dam of winners. MISTUH COACH KLEIN (USA), won 3 races at 3 years in U.S.A., £30,993, placed 3 times. PRECOCIOUS LADY (USA), won 2 races at 3 and 4 years in U.S.A.; dam of winners. BELIEVE (USA), won 2 races at 3 years in U.S.A. and £21,414, placed once; dam of winners. RECORD (USA), won Derby Trial Stakes, Churchill Downs, L.
Sergeant Drummer (USA), won 2 races at 3 years and placed 3 times including second in Extel Handicap, Goodwood, L.; sire. Zolotaya (USA), placed 3 times at 4 years in U.S.A.; dam of a winner. ZIMBAWE (CHI), winner in Chile; dam of Go Casablanca Go (CHI), winner in Chile, second in Premio Municipal de Vina del Mar, Valparaiso, Gr.2, Zuzuwi (CHI), winner in Chile, second in Premio Jose Saavedra Baeza, Hipodromo Chile, Gr.3. Grecian Gold (USA), ran in U.S.A. at 3 years; dam of winners. IRON AND GOLD (USA), won Clasico Polla de Potrillos (2000 Guineas), Hipo Monterrico, Gr.1, Clasico America, Hipo Monterrico, Gr.1, Clasico O.S.A.F., Hipo Monterrico, Gr.1 and second in Clasico O.S.A.F., Hipo Monterrico, Gr.1. Anna Johanna (USA), placed once at 2 years in U.S.A.; grandam of Ambrogio (PER), winner in Peru, second in Clasico Velocidad, Hipo Monterrico, Gr.3. Wild Noir (CAN), unraced; dam of a winner. SAGA (VEN), Champion 2yr old filly in Venezuela in 1999, won Clasico Edgar Ganteaume, La Rinconada, L., Clasico Ciudad de Caracas, La Rinconada, L.